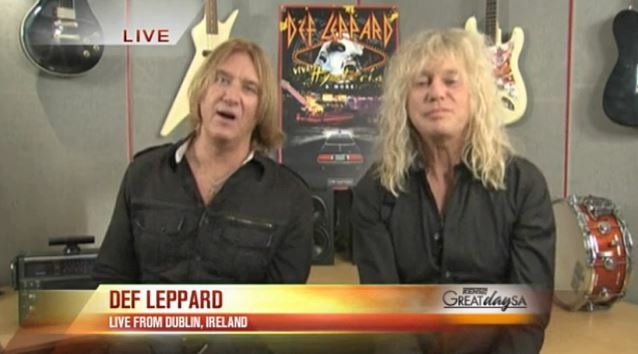 On Wednesday, September 25, San Antonio, Texas' Kens5.com conducted an interview with DEF LEPPARD members Rick Savage (bass) and Joe Elliott (vocals). You can now watch the segment below. DEF LEPPARD's recent Las Vegas extravaganza will hit the silver screen for two nights in October. NCM Fathom Events together with AEG Live and Network Live are bringing DEF LEPPARD "Viva! Hysteria" concert to over 250 theaters across the country with a full front-to-back performance of 1987's multi-platinum "Hysteria" album — along with a healthy dose of the band's greatest hits. Tickets for the screenings are available at participating theater box offices and online at www.FathomEvents.com. According to The Pulse Of Radio, Joe Elliott shed some light DEF LEPPARD's recent Vegas residency at the 4,000-capacity Joint at the Hard Rock Hotel & Casino, explaining, "We've been asked for many years if we'd ever play an album in its entirety, and the answer was always no because we'd be out promoting a new album. Then in March and April 2013 when we had no new music to promote, we had a chance to revisit arguably our most important album. It was an easy decision to make." He went on to say that the stigma involved in rock musicians playing "Sin City" has long passed: "As for Vegas, it's no longer perceived as the place crooners go to die! Artists like MÖTLEY CRÜE, ELTON JOHN, GUNS N' ROSES and CHEAP TRICK have recently done residencies and rock n' roll has definitely moved in! So, there was no better place for us to take the show. It was a fantastic experience for us and for our fans." Joe Elliott told The Pulse Of Radio that the band's humble beginnings back in England never even hinted at where they'd be today. "35 years after starting out in a little school in Sheffield, and then the next thing we're doing a residency in Vegas," he said. "It was never on the agenda back then, y'know? But being in a band more than seven or eight years wasn't either. So, at this moment in time you're just kinda making things up as you go along, because, things just keep appearing for us. Like; 'Hey — you guys fancy doing this?' 'Well, that's something we've never done.' And as soon as we can say that out loud, it's appealing for us to do it, ''cause it gets you off the treadmill." The theatrical showings will be followed by a companion DVD, Blu-ray and live album that Elliott tells Billboard.com will chronicle "the whole shebang" — not only the "Hysteria" set but all of the other songs DEF LEPPARD played over the two nights the show was filmed. "VIVA! Hysteria - Live at the Joint, Las Vegas" will be made available on CD, Blu-ray disc, DVD Video, and digital download in October at your favorite music retailer.